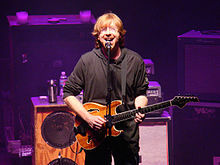 Whistle Pig Vail on Tuesday announced its third major act slated to play this summer at Vail’s Gerald R. Ford Amphitheater, with the Trey Anastasio Band set for Monday and Tuesday, Aug. 12-13. Anastasio, the former Phish front man, is not new to the Ford Amphitheater. He jammed on the stage with the legendary Carlos Santana in the early 1990s when Phish was an up and coming act out of Vermont. The gates open for both Whistle Pig Vail Trey Anastasio Band shows at 6 p.m., and the shows start at 7 p.m. Tickets go on sale at 10 a.m., Friday, April 5. Go to WWW.WHISTLEPIGVAIL.COM or call (970) 845-8497. General admission tickets are $55, and reserve seats costs $68.50. Anastasio joins previously announced Whistle Pig Vail shows Steve Miller Band and Marty Stuart and His Fabulous Superlatives on Wednesday, Aug. 14, and Nathaniel Rateliff & The Night Sweats on Monday, Aug. 19.